I haven’t written about this before because it is such a difficult topic, but in light of recent events I think it needs to be said. I actually wrote an email to a podcast on this subject a while back because I was looking to spread the word about reaching out for help if you need it. Funny enough, I was willing to have this personal information read on a public podcast, but I wasn’t yet ready to publish it on my own blog. Things are different now. There have been a number of high visibility suicides that have left the world reeling. It is tremendously sad and we’re all left asking, “Why?” There is no satisfactory answer to that question. Depression is a formidable foe. You never really know what someone is thinking or feeling, or how much they’re struggling – sometimes until it’s too late. Here is my story as I described it in my email in May. I waited longer than I should have before asking for help. Unfortunately society teaches women that we are supposed to be invulnerable. We must be strong, silent, efficient, and most of all, uncomplaining. I thought I needed to power through the sadness and hopelessness because that’s just what everyone else does. But when I started talking to my friends and colleagues about my difficulties I discovered that almost every one of them has been in the same situation at one point or another. Nearly every woman I know has experienced depression and benefited from medical intervention. But before I started this conversation I had no idea! This is why we need to have an open dialogue about mental health – to normalize it enough that people know that there are readily available resources when they’re fighting depression. So if you are reading this and you’re feeling low and contemplating hurting yourself, please reach out to someone, anyone for help. Also, do not hesitate to call your doctor. You don’t have to feel this way. The world is better with you happy, healthy, and still alive. 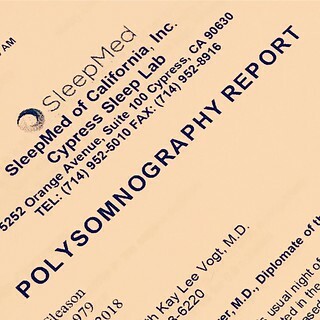 I had a doctor’s appointment on Wednesday to review the results of my sleep study last month. My GP read through the report and said, “Basically you’re running a marathon every night!” This is not a surprise to me considering how much trouble I’ve had with my legs over the last couple of years, but it was a relief to have data to prove that my problems are real and not imagined. I had an astonishing 550 leg movements during the night I spent at the sleep center, and I was awakened 8 times during the night because of limb movements. Also, only 6.4% of the night was REM sleep, which is way too little. No wonder I’m tired all the time! I’ve been operating under the assumption that I’m simply lazy which is why I am always drowsy and rarely have the energy or motivation to do anything. Now I know that’s absolutely not true. Even with Ambien helping me fall asleep quickly at night, lack of restful sleep is still causing problems in every area of my life. I’m so thankful that my doctor has taken these symptoms seriously, unlike some other medical professionals I’ve seen, and is helping me map out a path forward. As a next step, she wrote me a prescription for Requip, a drug that’s used to treat not only restless legs, but Parkinson’s Disease as well. We’re not messing around with my crazy legs! Unfortunately I have to work my way up to the maximum dose so it’s going to take me over a week to get to a level that might be effective. We’ll see how that goes. I also got a referral to a neurologist so if this particular pharmaceutical doesn’t work for me I will discuss other options with him at a future appointment. Until I am able to get some restorative sleep I am trying to honor my body’s need for more down time, but it has been difficult. I’m already a homebody so it’s not that I mind staying home more, but lacking the energy to complete my day-to-day chores means that things can start to pile up. My sink fills up with dirty dishes because I don’t always wash them in a timely manner. Cooking takes a lot of effort so I don’t always have healthy, homemade lunches to take to work. And I avoid going out shopping so I don’t always have nutritious food or other essentials in the house when I need them. It’s frustrating. Some days getting out of bed and changing out of my pajamas is about all I’m able to do. This is not beneficial to my mental health, but I am trying to cut myself some slack and let go of the guilt of resting as much as I need to. Just because I’m too tired to go to the movies or clean my house right now doesn’t mean I’ll always feel this way. I know this is a temporary state and I that I am strong enough to get through it. Life isn’t always easy, but I’m hoping that it won’t be long before I see the light at the end of this particular tunnel. Let’s hope my new prescription is just what I need. Last Friday I did a sleep study at a clinic. My doctor ordered the sleep study after I told her about my extreme daytime exhaustion, even after sleeping 8-9 hours at night. And that was with the help of prescription sleeping pills that I got in January when I was feeling so wretched. The pills were an absolute lifesaver because they helped me fall asleep easily, but I was still inexplicably tired the next morning. Also, there was another, much harder to describe symptom that I had to take to three doctors before I felt like I was getting any recognition at all. Basically, for more than two years I’ve been experiencing muscle spasms that start as soon as I get drowsy and cause involuntary movements in my legs. Naturally the periodic twitching and jolting (about every 10 seconds) made getting to sleep nearly impossible, probably prevented me from getting much restful sleep, and made me want to crawl out of my skin. But even after describing this sensation to the best of my ability, all of the doctors I saw seemed to be at a loss. They offered little insight into my symptoms or thoughts regarding a diagnosis or treatment. I was slowly going crazy. One doctor did mention the possibility of Periodic Limb Movement Disorder (PLMD), something in the family Restless Leg Syndrome (RLS), but presenting differently and more severely. Unfortunately after some routine blood work this doctor sent me a letter (yes, a physical letter – not an email or even a phone call in this day and age) to tell me that all of my levels were normal and I should be fine. Thanks for nothing. Fortunately the next doctor I saw referred me to the sleep study clinic (for my exhaustion, not my crazy legs, but I wasn’t going to complain) where I was hopeful that answers might be more forthcoming. So last Friday, in a very crude hostel-like room, my body was loaded up with sensors and I was told to go to sleep so that the necessary data about my slumber, or lack of it, could be compiled. I don’t think I’ve ever been more uncomfortable than I was lying on my back (not my preferred sleeping position) on the barely adequate mattress in that facility. I had wires coming off my scalp, my face, my chest, and my legs. The woman I spoke with when I made the appointment painted a much rosier picture of the sleep study than what I experienced upon arrival. I wanted to be a good patient, but even taking my usual Ambien wasn’t enough to overcome the anxiety of being in a strange place and needing to sleep on command for the purpose of science. The insomnia was strong that night. But for better or for worse, staying awake longer than usual gave my legs an opportunity to perform their little dance and provide proof to my doctor that some part of my body isn’t functioning as it should. At first I was nervous that my symptoms wouldn’t present themselves while I was at the clinic, but that fear turned out to be unfounded. That was the only bright spot of the night. I was miserable for more than an hour after lights out due to the leg spasms and even the sleep technician came in to check on me because I was moving around so much – and not all of those movements were intentional. I finally did fall asleep after much tossing and turning, but it was only for a few hours before the technician was knocking on my door at 5:45 AM to get me ready to leave. Hopefully that short amount of sleep was enough to help my doctor draw some conclusions regarding a plan of action. Heck, even the technician told me that he observed that I have a pretty serious case of PLMD. Not sure if that’s a good thing or a bad thing, but at least I’m going back to my doctor with some new information. I have an appointment to see her early next month to review the sleep study results, but I am almost certain that my next stop will be a neurologist’s office. In fact I’m so certain that I might try to make an appointment even before going back to my GP. Here’s hoping that it won’t be too much longer before I find a solution! P.S. I did a quick search of my webpage to see if I’ve written about this topic before, but it seems that I haven’t. I find that hard to believe since I’ve been suffering with this medical condition for over two years now. We all have our inward and outward struggles, but we don’t always share them with the world. I’m going to try and be more transparent with from now on. Brushing my teeth has always been an activity that I didn’t particularly enjoy. It was something I was obligated to do when I was groggy first thing in the morning, and then again at night when all I wanted to do was crawl into bed. Fortunately, my dentist has always told me that my teeth look great, but I’ve never really taken my daily dental care very seriously until recently. While I was feeling so terrible back in January I spent a lot of time reading inane Buzzfeed articles, and one of them was titled something like, “Amazon Products People Swear By.” One of the items on that list was the Philips Sonicare 2 electric toothbrush. I’ve been debating an electric toothbrush for many years now, but never did much research, much less pull the trigger on actually purchasing one. But in my somewhat compromised and easily influenced state last month the toothbrush caught my attention. So I did some comparisons on Amazon and ended up ordering the Philips Sonicare 2. The good news was that it cost less than $40 so I wasn’t making a huge commitment if I ended up hating it. I figured it was going to be one of those impulse buys that you kinda regret, but use anyway because you spent money on it. Much to my surprise, I couldn’t have been more wrong. I love this thing. For the first time brushing my teeth is fun! That sounds silly, but it’s true. There’s been a bit of a learning curve since I’ve never used an electric toothbrush before, but my teeth have never felt so clean. Hopefully my dentist agrees when I see him in May. So if you’re still waffling about purchasing an electric toothbrush, I can’t recommend this one highly enough. You’ll thank me later! 2018 has been teaching me a humbling lesson. We’re nearly two weeks in and I’m still not healthy. I’ve only been able to work two days so far (one of those being my birthday, but more on that in another post), and those were tough. I’ve only exercised once (I went to a boot camp class on my birthday) and that turned out to be a terrible idea because I experienced a relapse of my lingering illness the next morning. I’ve barely gone out my front door since New Year’s, and I haven’t had enough energy to do much of anything around the house either, so I’m slowly losing my mind. Suffice to say, things aren’t going well for me at the moment. If I think about everyone who’s out there living their lives to the fullest right now it makes me angry, jealous, and sad. And then there’s Facebook and Instagram showing me multitudes of pictures of smiling faces and all of their exciting experiences. It’s gut-wrenching for me. Especially seeing photos from my friends who successfully completed the Dopey Challenge last week. That was supposed to be me. I planned for it, I worked for it, and I deserved to cross the finish line with everyone else. But I’m starting to realize that I can’t live in the past anymore. I can’t compare my journey with anyone else’s. My best-laid plans didn’t come to fruition this time and I have to accept that. This wasn’t a failure, but an unavoidable obstacle that I had to navigate. The only thing I can do now is move forward. It certainly won’t be easy, but I think that once I’m healthy (whenever that is) and back to my normal routine that I can start preparing for the rest of the year. I cannot wait for that to happen. Right now I’m sitting in a hotel room in Carlsbad. Back in October I registered for the Carlsbad Half Marathon without considering that a flu virus could knock me down so hard that I wouldn’t be in any shape to run 13.1 miles on January 14th. So last week I called the race company to ask whether it would be possible for me to switch to the 5K instead due to my extremely poor health. Luckily that wasn’t a problem at all. So tomorrow morning I’ll be attempting to complete a measly 3.1 miles and finally, finally start my 2018 running journey. Hopefully that journey will culminate in training for neat year’s Dopey Challenge (January 10-13, 2019), but I have a long road to navigate before I get there. This first step is infuriatingly small, but I have to start somewhere. I wish I wasn’t so incredibly out of shape, but there’s really no other possible outcome after three weeks of near inactivity. These next few weeks are going to be painful. So many miles, so many races, and so many more obstacles waiting for me, I’m sure. Let’s hope I’m up for it. My progression through the stages of grief has been uneven, and also potentially nonlinear. I didn’t spend a lot of time in denial (first stage), but I think I more than made up for it with the intensity of my anger (second stage). Knowing myself, I’m probably going to be incensed about this unfortunate turn of events until I get my next shot at the Dopey Challenge, hopefully next January. But as of today I find myself buried in the fourth stage of grief – depression. I seemed to have skipped bargaining (third stage), but I’ll get back to that later. Even though the last time I updated my webpage I said I was going to try to go back to work, that actually hasn’t happened yet. On Wednesday night I made all of the necessary preparations to go to work, but then I woke up on Thursday morning with a severe sore throat and painful congestion. It was so agonizing that I reached for the prescription ibuprofen that I got from the urgent care doctor on New Year’s Day. The lymph node of the left side of my throat was swollen too so my body was obviously still fighting off some sort of virus. After a couple of days of these new and terrible developments I considered another visit to urgent care, but since I didn’t have a fever or other worrying symptoms I figured it wouldn’t be helpful. I already know that I had the flu and my body is more than likely just struggling to fight off the remaining strains. Luckily I felt marginally better when I woke up this morning so I think I’m finally on the road to recovery. I still slept all afternoon on my couch, though. I’m certainly not 100% well yet. The Walt Disney World Marathon is taking place tomorrow morning and there’s nothing I wouldn’t give to be there running with all of the other participants, including several friends. I haven’t run since December 26th and I know that I’ll basically be starting from square one with my fitness once I’m able to lace up my sneakers again. I’m not looking forward to that one bit. But in the depths of my despair today I’ll admit that I did a little research to see if I could determine when the Disney World marathon weekend will be held in 2019 so that can make some preliminary plans for that trip. Maybe this is the bargaining stage of grief intermingling with the depression? Actually, since bargaining is supposed to come before depression, maybe it’s more like acceptance (fifth and last stage), which would mean that I’m on the road to emotional recovery as well as physical. One can only hope. My body has been an absolute wreck since before Christmas, and I’ve been in a foul mood since I cancelled my Orlando vacation on Monday. So my favorite holiday was less than perfect, and the entirety of 2018 so far has been a disaster. Fantastic. In order to avoid making this year any worse than it already is I’ve been successfully maintaining my social media blackout for the past four days. I’ve spent the last week sick at home, staring at one screen or another almost the whole time, but actively avoiding the websites I most frequently visit. I’ve still been using Facebook Messenger on my phone to keep in touch with a few friends, and I sometimes check Twitter out of sheer boredom, but Facebook and Instagram are strictly off-limits for the time being. And it’s been refreshing. I definitely need to limit social media in my daily internet diet going forward. Maybe I’ll even make it one of my 2018 resolutions. But that will have to wait until I feel better, which will hopefully be very soon. As of this morning I found myself solidly entrenched in the second stage of grief – anger. I thought I was upset yesterday due to the cancellation of the vacation I’ve been planning for a year, but it turns out that was just the tip of the iceberg. I spent most of today completely enraged. Not only am I mad that this stupid flu caused me to miss the Dopey Challenge and my birthday vacation at Disney World, but I woke up to texts from my dad that it was snowing in Tallahassee. A once in a lifetime experience in North Florida. I feel like am missing EVERYTHING this week. I’ve been sick at home for the last five days and it feels like the world is rubbing salt in my open wound. What else can I be jealous/resentful/bitter about? Like people who are successfully working on their New Year’s fitness resolutions while I don’t have enough energy to leave my house for more than an hour at a time. And folks thriving on their new healthy diets while I’m eating leftover pizza because nothing else is palatable right now. I’ve reached my limit. So before even getting out of bed this morning I instituted a social media blackout until at least Monday. Maybe longer. There’s no use letting myself get even more bothered by my friends’ pictures from Disney World or playing in the snow in Tallahassee. I can’t be with them enjoying those experiences and there’s no use being reminded of that fact every time I’m online. The only option that isn’t detrimental to my already bruised mental state is logging off and focusing on myself for a while. Hopefully it won’t be too long before I’m healthy enough to resume my normal routine. I look forward to that. I’ll probably go back to work tomorrow so that will keep me from despondently moping around the house all day. Life is pretty gloomy right now, but I know it will get better. It just can’t happen soon enough for me. Today was marginally better than yesterday. (Let’s ignore the fact that I was supposed to be on a plan to Orlando this morning. If I dwell on that too long I’ll get really annoyed.) First of all, I successfully picked up the Tamiflu at Walgreens this morning. The downside? Apparently my prescription drug insurance doesn’t have a contract with Walgreens so the medication cost me over $100. And that was for the generic version! Ridiculous. The only reason I had to fill the prescription there is because no CVS in the area has Tamiflu in stock. Apparently it’s been a rough flu season already. So I reluctant paid the exorbitant price because Walgreens had somehow cornered the market on flu drugs and my insurance is woefully inadequate. Also, I was feeling very light headed standing at the pharmacy counter so simply giving them my credit card was the fastest way for me to get back to my car where I could sit down. So not only did I lose a lot of money cancelling my Disney World vacation due to this stupid illness, but it also cost me an arm and a leg for drugs to combat it! Even though I’m recovering, this whole situation seems to be getting worse every day. On a positive note, I managed to gather enough energy to go to the grocery store tonight. My refrigerator was relatively bare because I was planning to be on vacation starting today, and I’ve been too sick to go anywhere before now, so I’ve been living off Domino’s pizza delivery for the last two days. Not that I’ve had much of an appetite, but I’m still sick of eating food with no nutritional value. So this evening I filled up my shopping cart with mostly fresh fruits and vegetables. The produce department of the grocery store was pretty picked over, probably from all of the folks who are trying to fulfill their New Year’s resolution to eat healthier. I had to really search for a bag of broccoli florets (my preferred green vegetable for weekday lunches), and I couldn’t find the steam-in-bag green beans that I was looking for (so that I’ll have some much-needed green vegetable variety). Otherwise I had a very successful shopping trip. 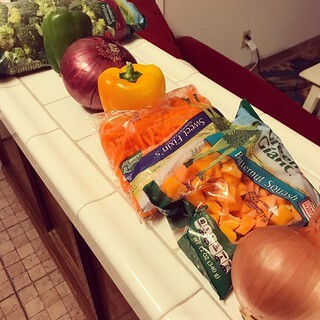 Even though I’m planning to stay home from work again tomorrow, I’m going to try and do a little cooking and food prep. 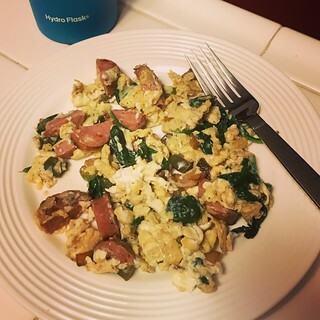 I might only be able to scramble some eggs for breakfast and chop up some vegetables for future salads, but that will be a major improvement over most everything I’ve eaten since I got back from Florida last week. In order to establish more permanent healthy eating habits (and, let’s face it, lose some weight too) I want to adopt a new meal plan as soon as I am completely over this flu. I’ll detail that in a future post. But for now I’m going to continue focusing on healing. I can’t wait to feel like myself again. Happy New Year! First of all, I have a lot of explaining to do regarding why I didn’t blog at all during the month of December, but that will have to wait for another day. There are a multitude of reasons/excuses that I didn’t write a single word since the end of November. In the simplest sense, life has been complicated, which made the end of 2017 less than satisfactory. But now 2018 is here, and with a new year comes a chance for a fresh start. And how did this one begin? With the flu. I could regale you with the entire sequence of New Year’s Eve events that led to my really awful January 1st, but that is not my intended goal for this post. In short, I had what I thought was a bad head cold which quickly morphed into the flu yesterday afternoon. It was miserable. What I want to share on the first day of 2018 is the aftermath of this very untimely illness. By the time I was attempting to go to sleep last night (long before midnight as I was too sick to care about ringing in the new year with any fanfare) I realized that my trip to Orlando on January 2nd was in serious jeopardy. Then when I woke up this morning, after a very fitful and feverish night, I put on some clean clothes (i.e., not the pajamas I had been wearing for over 24 hours) and drove to urgent care to consult with a doctor. I didn’t think had a fever anymore, probably thanks to the Aleve I took at 4 AM to combat a wicked headache, but I still felt horrible. When I arrived at urgent care at 8 AM to discover that it was closed I nearly cried. No where on their website or on their voicemail message did they indicate that the office was closed for the holidays. Don’t they think that’s information that should be readily available for desperate patients such as myself? I was extremely frustrated and I figured I wasn’t going to be able to see a medical professional at all today. Instead I headed to CVS to buy a thermometer because I thought I might still have a fever. In spite of it being 50 deg outside I was sweating like crazy. To my surprise, the pharmacist told me that their Minute Clinic was going to be open at 10 AM so I would be able to see a doctor today after all. About two hours later I walked out of the Minute Clinic with a prescription for Tamiflu. Then came my attempts to fill it. Once again, I’ll refrain from going into extreme detail, but the bottom line is that I drove to three different pharmacies and was unable to get my prescribed medication at any of them. I will have to try again tomorrow. So that brings us to the worst part of January 1st. While standing in line at the third pharmacy I felt so weak that I thought I was going to pass out. That’s when I realized that there was no way I was going to be able to participate in the Dopey Challenge at Walt Disney World this weekend. When I got home and wearily crawled back into bed I made all of the necessary phone calls and mouse clicks (no pun intended, Mickey) to cancel my trip. This was the very outcome I was trying to avoid, but I knew that even if my health improves significantly over the next few days that I still wouldn’t be in any shape to run 48.6 miles between Thursday and Sunday. Heck, I can barely run a marathon on my best days! It would be an understatement to say that I’m disappointed that I won’t be on a plane to Orlando in the morning, but I know staying home was the right choice. I worked so hard to prepare for the race challenge so admitting that I was defeated by a simple virus is making me crazy. I guarantee that over the next week I will feel many moments of anger, sadness, and generally regret. I am going to second guess my decision a million times. It’s going to be awful. Even so, I had to put my health first. As I was reminded by one of my running buddies, there will be other races. It’s hard to see that right now, but she is absolutely right. Not everything in life is going to work out according to plan and you have to figure out how to make the best of unfortunate circumstances. If possible I will attempt the Dopey Challenge next year, but for now I am going to focus on healing and recuperating. I will live to run another day! I didn’t want to, but I went for a run tonight. When I got home from work my couch was calling me. Loudly. It looked so inviting, right there in front of my laptop and the TV. I could have sat down there, unmoving, and entertained myself with all forms of electronics until it was time to get ready for bed. But somehow I managed to drag myself upstairs to change my clothes in preparation for a run. And I’m so glad I did! Based on my running performance over the last 10 days (the marathon itself plus my last few training runs beforehand) or so I wasn’t expecting much tonight. However, by some miracle I felt great and even ran 5 miles because I wasn’t completely exhausted after 4. The best news is that I don’t seem to have any lingering ailments from the marathon on Sunday (except my wounded pride). I do have an appointment with my podiatrist tomorrow because my new orthotics aren’t quite supportive enough to correct my overpronation. I discovered this just before the marathon and I need to get the problem corrected before my next long training run. Isn’t my life exciting? I’m even boring myself now so I’m going to get ready for bed. After washing some dishes. Because if there’s one thing I can say about this new diet it’s that my sink is always full of dirty dishes. I really wish I had a dishwasher. P.S. The PMS cravings were strong today. And all the ladies out there know that they’re just the opening act for the horrors to come. Cramps are the least disgusting thing I have in my immediate future!